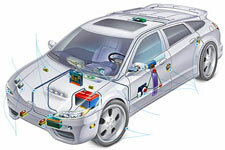 We provide comprehensive automotive electrical engineering services. We supports internal vehicle design and development projects as required, and provides services for any customers requiring electrical systems work design or drafting. Our team of experienced engineers has been keeping up with the demands of the industry and has been steadily growing. Test benches designed to suit our customers’ requirements including vehicle based test systems, component test systems, End-of-Line (EOL) production test systems. Unique control system development – laptop or desktop computer based, or custom embedded control system. Contact us to get free quote on electrical system engineering solutions.